Conrad Rocks! : Guy Fawkes and the King James Bible. Guy Fawkes and the King James Bible. This poem is a tribute to the failed gunpowder plot attempted by Guy Fawkes and his accomplices in the year 1605. Guy Fawkes and conspirators agitated with King James’ anti Roman Catholic laws had intended to blow up King James and the House of Lords. News of the plot eventually leaked. Early on the morning of November 5th 1605, magistrates found Guy Fawkes guarding 36 barrels of gunpowder beneath parliament. After increasing degrees of torture he finally gave up his coconspirators and all were captured and killed. King James gave his permission to translate the bible into English in 1604. If King James had been killed, then the Authorized King James Translation would never have been a reality. 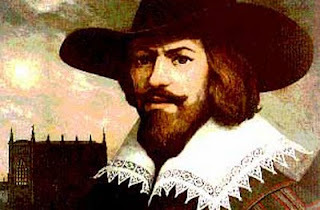 Guy Fawkes is still remembered after 400 years. His name has undergone a metamorphosis which has males referred to as “guys” and of course Guy Fawkes is perhaps the most notable of ‘fall guys’ being that he was alone when the conspiracy was found out. V for Vendetta is a daring, highly entertaining film with a significant tribute to Guy Fawkes. The film focuses on freeing people from an oppressive government using the 5th of November as its central theme. well there you go......I just learned something new! I really only recently put two and two together on this. I knew the KJV was authorized in 1611 and Guy Fawkes was after King James. i did a little research, and found out Guy could have sabotaged the KJV! It's funny though that Guy Fawkes is now celebrated as a "smaller government" hero, when he was nothing of the sort. He would have the protestant theocracy replaced by that of a Roman Catholic one. But hey, the movie was awesome. I love the 1812 overture and I love explosions. Put the two together, and I'm sold. Aaron, i used to think of him as a "smaller gov hero" only because of the hype of the movie. This serves to illustrate how media shapes our presuppositions.